tried to send a message earlier that seems have got lost in cyberspace . and plays guitar and bass guitar. nowhere, but I'll post more details and pics if all is well. had lying around for a little while now. twenty hertz stuff vibrating various items on the patio, even more at thirty hertz. quite audible, though I feel the SPL is dropping off around 8000Htz or so. 2 x 12"s. We shall see . Until then, here's another pic, with a certain item to give it some scale. That's a good looking speaker. You've got more guts than me, I haven't got the experience to build stuff from theory. I rely on tried and tested plans to copy. When it comes to finishing the rest of the cabinet, consider keeping it a light colour. There is a nice contrast with the black front and horn mouth against the lighter colour of the outer cabinet. Explain please how it is half? All heights different in the pic with the beer bottle. And it seems much narrower. Mouth is not square but what are the mouth dimensions? Or is it indeed all the same just cut in half down the front view? Hey Chris, allowing for the fact that I was using 18mm chip instead of the preferred 3/4" ply, I cut the speaker chamber braces to size, and used a ratio of 18.5/19 x 'Decware Plan' to give the appropiate horn dimensions. This gives me a speaker 7/8" shorter and 3/8" shallower than the plan. The width of the box is a whisker less than half the true Imperial. A single jarrah wood brace secures the rear of the horn, and is a nice touch too. Eventually I would like to use a fine piece of jarrah ply for the 'speaker panel'. This is one item that will get extra reinforcement in the shape of some angle iron braces. 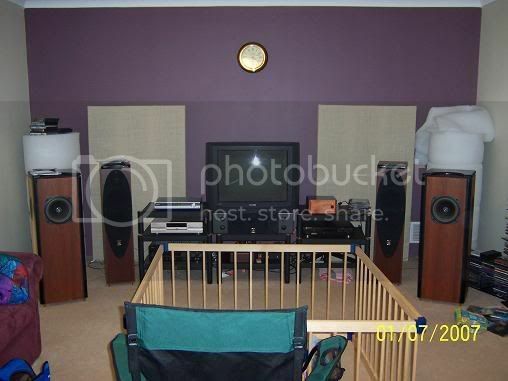 The speaker panel is all holes and can only benefit with some extra stiffness. I agree Simon that a lighter colour on the outside of the box would be a good contrast to the dark interior, but I'll probably finish the outside with the black hammer finish, if only to match my existing speakers and in keeping with a common theme. Looking forward to seeing your SO. Looking good. shook every item in my house, and the neighbours too. midrange and nice bass, but I'm not kidding myself, and don't you either. I wonder if the FS was lower it would play lower. It would be interesting to try a single 12 with a Fs lower than 30. John in C.R. did some sims with a half IMP as a sub it was looking favorable. A low Fs full range 12 always interested me in a half Imp. And for now, here is the finished product. sometime before I start cutting wood. in the half Imperial and see what delivers. not only mismatched, but mis-sized driver scenario. going to put them?' Ahhh, leave the fine print till later huh. You guys know what I mean. Oh okay, here is one more pic of my woofer. was told when her boyfriend bought him. You're leaps and bounds ahead of me. I haven't done that much more than what I've photographed. Too busy at work which is leaving me tired and unmotivated to go out to the garage. It would be helpful if you purchased Steve's plans. The various angles, shape and size of the horn (but ~1/2 width) are identical to the Full Imperial. My major detour being the use of 18mm particle board, the heavy stuff used for flooring. I think I've got the 18mm/19mm original ply conversion sorted. This is where I can be of some help. Just need to run a tape measure to give you overall h x w x d type stuff. That'll work....I get the plans and then we can go from there, Thanks! I'll get the tape maeasure ready! more open inner chamber I noticed. I'll get back to you shortly. Firstly though, what grade (thickness) wood are you planning on using. That is the major concern when figuring out height and depth issues. As you see, the Imperial plans are for 3/4" (19mm) ply. Then thats easy. For height and depth, you cut the wood as per Steve's plans. The width is the only modifier, which in my case, is a whisker less than half. (Can get exact measurement). I guess the only other factors which might alter tonality and response is the amount and type of filler you put in the speaker chamber - of which I used very little. One thing I never got around to doing was stiffening the front face of the speaker baffle. I figure that may help sound even better = less extraneous vibrations imparted to the drivers. Definately, not the backseat of a vehicle....Except a motorhome! of the upper chamber space where the throat begins? The baffle chamber size and shape are exact to the plans, other than the width of course. The baffle chamber, being one of the trickiest components, may well be one of the first pieces to build. By the way, what do you reckon of the full sized Imperial plans? When I finally got my head around what I was seeing, I was amazed. I printed out the plans on A3 paper, in colour. Made things much clearer. Errr, my smilies don't seem to be working? I gave up using smilies for a while. the inner chamber vent.....I think it's one inch it looks like. Correct! The next one is two inch, then shortly after that, it gets bloody big! If you where to build the 'half' Imperial, what driver/s where you intending to - err - drive. may sound impressive in such a cabinet design. The 12" Electrovoice Wolverine speakers should be great, in which case you may end up building an Imperial about 2 foot wide. Or, you could build two 1/2 Imperials with an 8" + 12" in each cabinet! You've got me thinking! I've got a pair of twelves (or is it tens) still in the boxes, hmmm, maybe I could try 2 x 8" + 12" + the Vifa tweeter. As I described in my build, the baffle plate (what the speakers are fixed to), is removable and interchangeable. If you are concerned about using different sized speakers in the same Imperial, don't be. Check out some of the earlier posts, you'll see some wildly differing differing drivers in the same box. The design of the Imperial almost makes this mandatory and of course, the original texts where based around this delta. Me thinks I might be buying a piece of board next week, time I had another play. I have built 2 half-Imperials and use them for live music. I simply cut the plans in half, taking into account the thickness of the material I used (3/4"). I have used the speakers separately as 2 mains on either side of our stage, or as one speaker(both halves placed next to each other). When used as one, they basically act like one full size Imperial, which was my intention (I have a second full size imperial also). As individuals, the half-imperials sound good but don't have the low bass power of the full. I loaded all my speakers with 15" Dayton Pro speakers and use a horn for the upper ranges. Just an FYI if it helps you out. Good luck and enjoy your imperials, whichever configuration you build! Teaching the virtues of horn loading one Open Jam at a time.